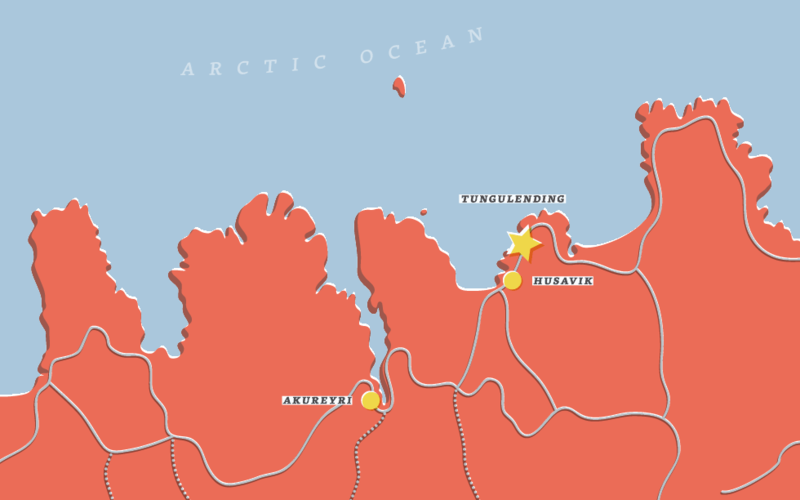 Tungulending is located in the North of Iceland, right next to the North Atlantic Ocean. It is situated on the Tjörnes Peninsula about 12 km north of Húsavík. From Tungulending you can reach various famous attractions like: Húsavik Whale Watching, Dettifoss Waterfall, Ásbyrgi Canyon, Myvatn Area, Goðafoss Waterfall and the GeoSea Spa Bath. All sites are accessible within 1 hour drive. Stay for several days at Tungulending Guesthouse and use it as your temporary base to explore the North-East of Iceland. How to get to Tungulending? From Reykjavik: You have different possibilities to reach the North of Iceland. The easiest ways to go north are by car, bus or domestic flight. You can take a bus or plane from Reykjavik to Akureyri or directly to Húsavík. 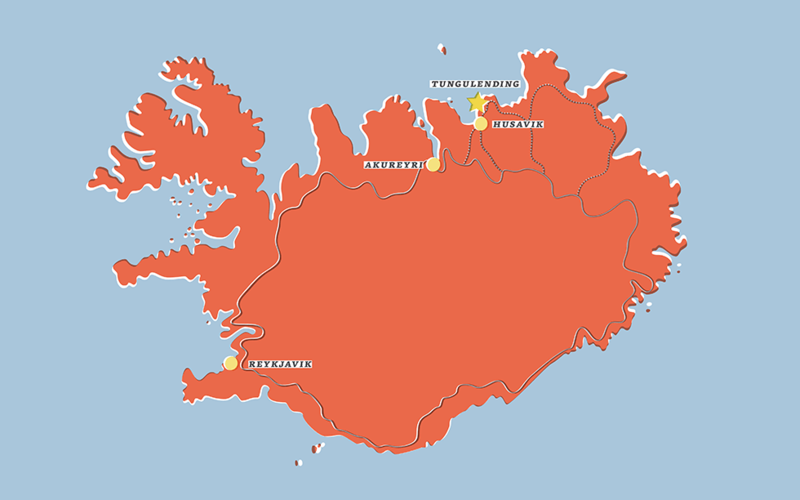 As soon as you are in Húsavík, Tungulending is easily accessible by car. Please contact us if you need further information or any help to get to Tungulending. From Akureyri: Drive in the direction of Lake Myvatn / Húsavík on Ring Road 1. After 45 km turn left and follow the road Norðausturvegur 85 towards Húsavík. Pass Húsavík and continue driving north on Norðausturvegur 85 until you reach a sign called “Tungulending”. Turn left, open the gate and follow the gravel road towards the sea. Please do not forget to close the gate after you have passed it! As soon as you reach the cliffs you will find Tungulending next to the sea. During summer time the steep gravel road will be open all the way down towards Tungulending. If you like, please consider to leave your car on top of the cliffs. From Húsavík: Drive in north direction out of Húsavík and follow the road Norðausturvegur 85 until you reach a sign called “Tungulending”. Turn left, open the gate and follow the gravel road towards the sea. Please do not forget to close the gate after you have passed it! As soon as you reach the cliffs you will find Tungulending next to the sea. During summer time the steep gravel road will be open all the way down towards Tungulending. If you like, please consider to leave your car on top of the cliffs. From Öxarfjörður: Drive in the direction of Húsavík and follow the road Norðausturvegur 85 until you reach a sign called “Tungulending”. Turn right, open the gate and follow the gravel road towards the sea. Please do not forget to close the gate after you have passed it! As soon as you reach the cliffs you will find Tungulending next to the sea. During summer time the steep gravel road will be open all the way down towards Tungulending. If you like, please consider to leave your car on top of the cliffs.